ATV Parts, ATV Radiator Kits, ATV Wheels Tires, ATV Suspension Springs Shocks Bumpers - Wild Boar ATV Parts > Radiator Relocation Kit > Suzuki King Quad 450/500/700/750 (05-18) w/ Screen (Red)$189.00 FREE SHIPPING! « BKT AT 171 31-9-16 Big Wheel Kit Starting at $1,210.00 FREE SHIPPING!! 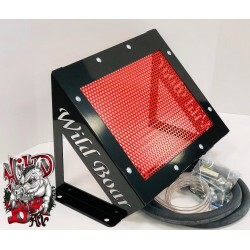 Wild Boar ATV Radiator Relocation Kit for the Suzuki King Quad with Red Screen (also available in Silver) on SALE for $189.00 includes FREE SHIPPING! This item comes with everything you will need to do a complete install! We all know that the second you purchase your new Suzuki King Quad, you’re going to want to go hit the trails.Whether you live in the north receiving multiple feet of snow or live in the south where the gator swamps are, you run risk of clogging your radiator and over heating your machine. Here at Wild Boar we offer a solution to keep your King Quad running all day no matter what kind of weather you’re in. Here at Wild Boar we understand the frustration of having to stop every 20 minutes because your machine won’t keep cool. That’s why we are happy to offer some of the best radiator relocation kits on the market. Keep your machine cool while riding in style our new radiator relocation kit for your Suzuki. These kits are all Steel construction, complete kits that include all the necessary mounting hardware you will need. Laser cut and powder coated. This will not only be the most solid Radiator Kit on the market, but the best looking kit you’ll see around.